Terrifying footage shows first time hang glider hang on for dear life as pilot struggles to land, after forgetting to attach student to the glider. 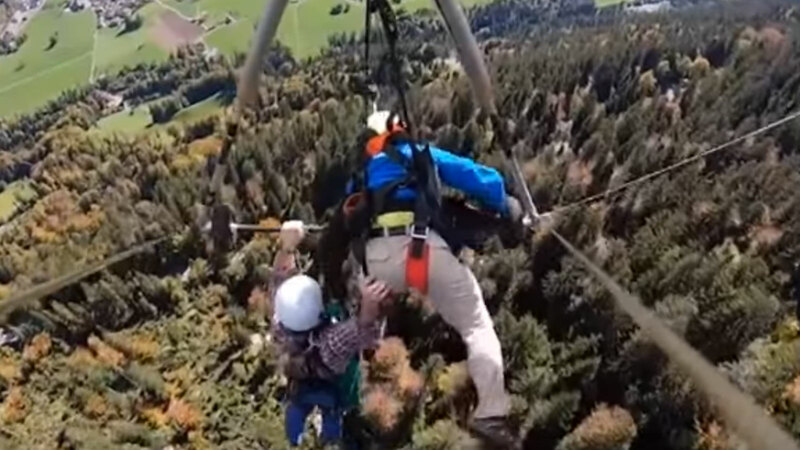 YouTuber Chris Gursky was enjoying his first day on holiday in Switzerland, when he decided to try hang gliding but the fun activity soon turned into something more dangerous. After takeoff Mr Gursky and pilot very quickly became aware that his harness isn’t hooked on to the glider as he struggles to find something to hold onto. The pilot struggles to keep control of the glider as he steers one-handed while trying to keep a hold on Mr Gursky. He desperately tries to navigate them down the 1200m mountain failing his first landing attempt he takes them higher over woodland. The pilot manages to regain control as Mr Gursky clings on to his leg and crossbar. Mr Gursky loses his grip right before their 45mph landing.